Clearly, The Kolibri has survived! Keep an eye on those sneeky bar-stools. They may have hidden away in the back of your car, anticipating a moment when you may be alone or asleep. Ah, I see the internationally famous gang of feathered bandits are on the loose again! 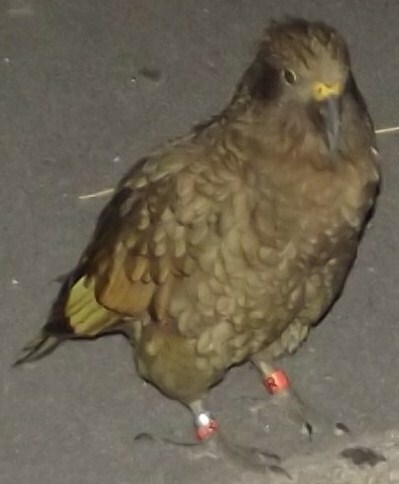 That Kea looks slightly annoyed to have been caught in the act, but also eerily cool with having his picture taken. Or is he used to pose for his mug shots? "Face the camera... now turn right... turn left..."
Good job protecting the Kolibri, sir! Those keas have good taste!!! Hahaha! 3) What is the airspeed velocity of a Kea laden with one Groma Kolibri? Reminds me of the stories I've heard about macaques in India. They steal stuff all the time from tourists and natives alike. Sounds like you were tempting fate and making life too easy for them. Maybe they are just waiting for a homecoming Kiwi with a Blickensderfer Featherweight?